We’re back from Disney and I have a few pictures to post. I’ll get to that later, but for now here’s a photo of the cookies I baked this morning using a few household staples. where all the cookies are made with booze. Louise, who owns the book, sent me a few other recipes from it and they all sounded good — Tequila Sunrise Bars, Vodka Citrus Shortbread, Kamikaze shots and Amaretto Sours. At less than $4.00 for a used copy, the book is a bargain. I was in the mood for chocolate chip and these were just perfect. They have enough Bourbon so that you can actually taste it (Fuzz did, and decided she didn’t like the cookies), and they’re puffy and handsome – or sort of. They’re on the pale side thanks to all the baking powder, but I think they look nice in a cakey-cookie sort of way. Now here are my changes. The original recipe didn’t have any salt whatsoever and called for unsalted butter. It also used about half as many chocolate chips and slightly more nuts. I added a bit of salt and doubled the chocolate chips. Preheat oven to 350 degrees F if you are baking the cookies immediately. Skip this step if you plan to chill the dough. In bowl of a stand mixer, beat butter until creamy. Add both sugars and continue beating for 2 minutes, scraping bowl often. Add eggs and beat just until they are mixed in. Beat in the Bourbon. Scrape sides of bowl again. Thoroughly mix together flour, baking powder and salt and gradually add to batter, stirring just until blended. Stir in chips and nuts. Drop by very generously heaping tablespoon 2 inches apart on parchment lined or lightly greased baking sheets. Bake for 12-14 minutes or until edges are nicely browned. ooohhh, these sound yummy! will have to try them!! my local library has the cookbook!! got it on reserve now!! Chocolate Chips cookies and Bourbon (especially Wild Turkey) are my dad’s 2 favorite things. I have to make these for Father’s Day. Thanks so much, they look wonderful! bourbon in my cookies….wow…..I know my brother would love these! Hope you had a wonderful time at Disney, its been way to long since I have been down there! Ha Ha. Ramble away! I like hearing what everyone’s making. Thanks Jenn! I thought of you as I was reading a book of creativity tips from Imagineers. Interesting, I’ve never heard of bourbon cookies. Sounds good though! The german chocolate thing sounds interesting. I just saw a recipe for german chocolate coconut pecan frosting. I have been making Amish Friendship bread and blogging about it, I was thinking about doing a german chocolate next time around. It’s the husbands favorites. I actually think that I made something of yours that was german chocolate related. Not sure what it was though. I’m rambling, sorry. Bourbon. I’ve never tasted it in a beverage, but I once had some chocolates laced with Kentucky bourbon and I didn’t appreciate it. Ever since then I shy away from anything with bourbon in it. I’m probably missing out on all kinds of good stuff. Oooh! I just finished undergrad (graduating this Sunday!!! ), and although this undoubtedly signals an end to the craziest of my college years, I would still love to get my hands on a cook book like this! Can’t wait to see your Disney photos. It’ll still be another couple of years til we make it back there (after my lil sis graduates from high school), but I’m dreaming of San Angel Inn already. Lisa, the Bourbon cookies are good, but I’ve already bought the ingredients for the German Chocolate Chip Cookies and plan on making the dough today. The dough requires a long chill so the cookies won’t be up until tomorrow. 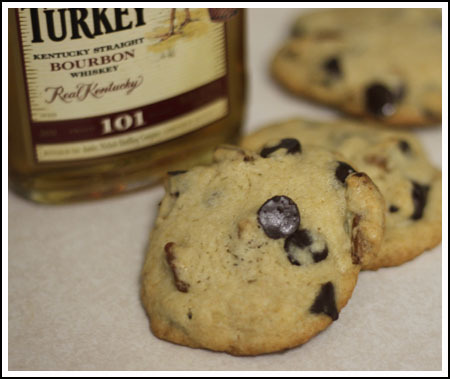 It never occurred to me that a cc cookie recipe might call for bourbon. Yet this is kind of intriguing. I actually haven’t tasted bourbon since my wild teenage years, when I tried it once or twice and found it just to horrible to tolerate. Really, I was too young to be trying something like bourbon anyway. No doubt my taste has matured since then and I would probably appreciate it now. But for the moment I’m patiently waiting for the German chocolate chip cookie clone recipe!